Mutual fund houses are wooing parents with niche offerings that promise to help build a corpus for their children. Want to create a corpus for your children's education and marriage? Insurance plans are not the only option. Several mutual fund, or MF, houses now offer child plans tailored for this purpose. Currently, seven such plans are available; these are mostly hybrid assetallocation funds with a portfolio of debt-equity mix. The most recent one was launched by Fidelity Mutual Fund on January 6. More such plans are waiting in the wings. For instance, an application from Peerless Mutual Fund for a similar offering is pending with the Securities and Exchange Board of India, or SEBI. Unlike the hybrid asset-allocation funds, however, some of these plans come with an option of a lock-in period, which could be either three years or till the child attains the age of 18, whichever is later. A majority of these plans come with multiple options based on the asset allocation. In a typical aggressive plan, the portfolio will have up to 70 per cent exposure to equities and the balance to debt. On the other hand, a conservative plan will invest up to 70 to 75 per cent of the money in debt. "The investments are made in traditional asset classes of debt, equity and gold. However, the investment pattern and duration differs from that of normal mutual fund schemes. Also, the duration of the underlying instruments is chosen to reflect the long-term nature of the fund," says Akshay Gupta, Chief Executive Officer, Peerless Mutual Fund. Many financial planners question the relevance of child plans in mutual funds since they do not contain any provision to secure the child's future in case of the death of the parent/s. However, some argue that a term insurance plan can be used to provide adequate cover. 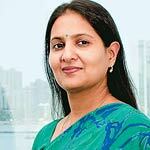 "Unpredictability should be covered by insurance and predictable investment decisions through MFs. Time and again, it has been proved that both instruments serve varied purposes and one must not mix the two," says Gupta. Jaideep Bhattacharya, Chief Marketing Officer, UTI Mutual Fund, says goal-based schemes such as child plans help investors allocate a part of their savings for a specific purpose, which is the essence of these funds. When it comes to saving for children's future, financial planners have always preferred a combination of mutual funds and term insurance plans. According to them, child plans based on unit-linked insurance products, or ULIPs, are expensive due to their high initial charges. Sumeet Vaid, Managing Director, Freedom Financial Planners, says even a combination of an equity-oriented child plan of mutual funds and a term insurance plan can serve the purpose of saving for your kids. Ashu Suyash, Managing Director and country head, Fidelity India, says the need for protection gradually decreases with time, but the need for wealth increases. "When you become parents in your 30s, you may have to pay almost 2 per cent as mortality charges for some ULIPs, apart from several other charges. When you put away money for 10 years in ULIPs, you pay a lot unnecessarily. Wealth creation will not happen," she says. However, according to Veer Sardesai, a financial planner, investments in pure equity funds can achieve the kind of corpus one may need in the future for child's education and other goals. "An ideal combination would be an index fund and a term plan," he adds. 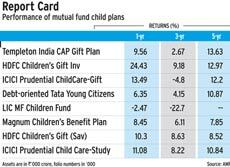 Child plans of mutual funds are ideal for those who do not have much time or expertise to actively build a portfolio. The performance of the existing funds over the past five years clearly shows that equity-oriented funds (with over 65 per cent exposure to equity) have given returns of more than 12 per cent on an average. In contrast, debt-based schemes have given 9 to 10 per cent returns in the last five years. With soaring education costs and high inflation, one could consider going in for equity-oriented funds as equity is the only asset class that beats inflation in the long run. "Risk and reward go hand-in-hand. If you don't take the extra risk, you will not achieve much. Extend the same thing to the plan for your child. Risk averse investment will not be able to beat inflation," says Suyash.